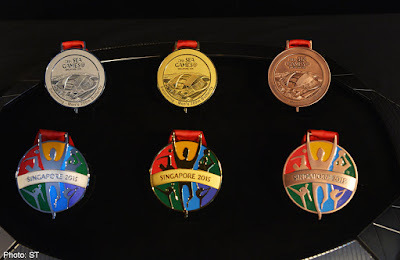 Singapore's Eng Leong Medallic Industries has made a total of 1,327 medals for the 28th Southeast Asian Games 2015 happening on June 5-16 in Singapore. People behind the making of the medals did a fantastic intricate job with such accuracy and perfection. Any athlete would be really proud of having these in their collection. The design of the medals was unveiled on April 27, 2015. Designed by Joys Tan from Sport Singapore, they feature the Games' logo on the front side, and the Singapore Sports Hub at the back. Each medal measures 80mm in diameter and weighs 183 grams. 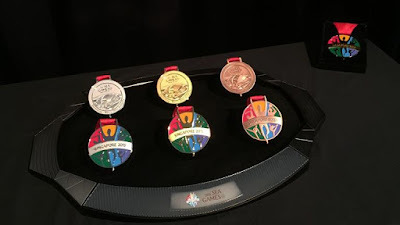 It was also announced that smaller versions of the medal, in the form of medallions, will be given to all spectators of the closing ceremony to be held at the Singapore National Stadium on June 16, 2015 (Tuesday). Attendees would be very lucky to have the medal in their hands. I wish I am there too.